The holiday season is a joyful time of the year, but it also can be stressful for kids with autism spectrum disorders (ASD). Preparing and planning early for the holidays can help you relieve some of the holiday stress. Members of the Autism Parent Advisory Board at Children’s Hospital Los Angeles, a member of the Autism Speaks Autism Treatment Network, partnered with Kathryn Smith, RN, DrPH, nurse care manager in the Boone Fetter Clinic to provide tips every parent and caregiver can use during the holiday season. Creating a visual story (a series of pictures or drawings) before each holiday can help your child prepare for the day’s activities. Here are some ideas to help you and your child enjoy the holidays this year and every year. Practice sitting at the table with the plates, lighting and music before the holiday gathering. Draw pictures about the holiday to help your child prepare for the events. 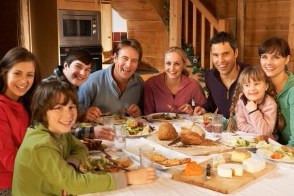 Eat holiday foods in advance to determine what your child does or does not like. Help them become more comfortable with the food selection. Reflect on your holiday traditions and your child’s sensory and behavioral profile and how your child will interact with these traditions. Prepare for the family environment. Will you be at grandma’s house? Another family member? Consider preparing an area for your child to play, or a space for your child to decompress if they become overwhelmed by the sensory stimulation. Encourage other children or adults to join your child. Prepare an activity for your child, if you know they have an aversion to a holiday tradition, like watching football on Thanksgiving Day. Your child may not like loud noises, so take your child outside to play or have the children play games in another room. Talk to your occupational therapist for recommendations on how to prepare your child to handle the noise of the holiday season. Are they attracted to the lights? Do they have an aversion to the lights? If so, do not use lights and add ribbons, paper chains and other festive touches. What is an alternative to having lights on your tree if your child has an aversion? Is your child allergic to pine? If your child likes to pull pine needles off the tree and eat them, consider an alternative, like an artificial Christmas tree or place a small real one on a high table, out of reach. Do you have glass ornaments and is your child safe with these? If not, consider only plastic ornaments. If your child doesn’t have fine motor skills, practice opening gifts. For example, have your child wrap little fun objects and open them. Put pictures on the gifts instead of names because your child might not recognize everyone’s names. Make a calendar so your child knows when the tree is coming and going to the recycle bin or getting discarded. Consider hiding gifts until it’s time to open. Practice any expected behaviors in advance, like shaking hands with a guest, placing a napkin in a lap, etc. Prepare your child’s favorite foods and snacks in case the child doesn’t like the holiday meal. If you are going to another home, take your child’s favorite foods, music and snacks with you. Schedule an early dinner or eat in advance to a family get-together. Reward your child throughout the event and reinforce positive behaviors. Use ABA/floor time techniques: “First, we will do this,” “Second, we will do this,” etc. Assign tasks that you feel your child can manage, so they can participate on some level. Keep your eye on your child for signs of anxiety or distress. If your child is very active take them to the park or a place where they can freely move to help them calm down. Take great care to be sensitive to your children’s sensory issues. Print this blog post and pin it on your bulletin board at home and share these tips with parents and caregivers for kids with autism spectrum disorders.